Video A photographer in a public place was called a “lunatic”, "detained" by private security guards and had the police called on him after he videoed a wall outside the Port of Tyne. Footage posted to YouTube by 24-year-old media production graduate Alan Noble shows two security guards employed by the Port of Tyne remonstrating with him on a traffic island next to a roundabout by the port's entrance. One guard, with blue eyes, grey hair and wearing a blue fleece and lanyard clearly marked with “Port of Tyne”, can be clearly heard on the video. He explained that to make his film he wanted to video the large Port of Tyne sign from the road running alongside the docks so he could make a time-lapse exposure of traffic driving past it. The guard in the blue fleece appears to call Noble a “lunatic”, while his colleague, in a yellow hi-vis jacket, later seizes hold of Noble's camera tripod and refuses to let go of it. Noble can be heard saying “I didn't give you permission to touch my property,” while one of the guards replies, “I didn't give you permission to take photographs of our property … yes, you do, yes, you do.” One guard then demands to see what Noble had taken pictures of. I've got a gentleman who's been taking photographs of the port and I believe he might be involved in hostile reconnaissance so I'd like immediate police attendance, please. Noble said he was on public land during the whole incident, which appears to be the case from the footage he posted on YouTube. Northumbria Police constables, upon arriving, confirmed that Noble had done nothing wrong and broken no law. 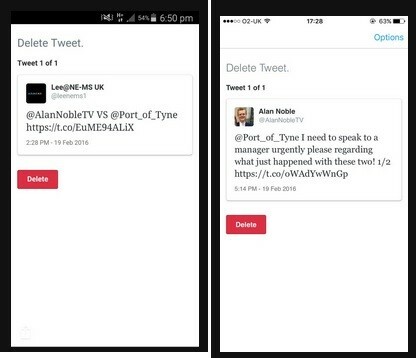 Noble Tweeted the Port of Tyne immediately after the incident asking for the organisation's contact details. He discovered later on that his Twitter account had been suspended and he was presented with instructions from Twitter to delete two Tweets referring to the incident before he could regain control of his account. He told The Register that the Port of Tyne's official Twitter account had also blocked him. “This position from security guards is endemic despite it having no basis in law and we'd like to see the industry and its regulator step up and deal with it through better education and enforcement,” added Mattsson. * El Reg asked what exactly those regulations are. 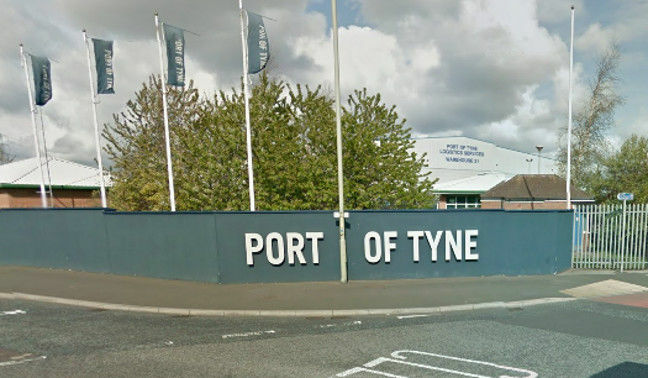 The Port of Tyne replied: "The International Code for the Security of Ships and Port Facilities requires the Port of Tyne to maintain a high level of security in and around the Port facility, expressly covering the approaches to the Port on land and water." (b)remain in any part of such a restricted area after being requested to leave by the port facility security officer or a person acting on his behalf. (2) Paragraph (1)(a) shall not apply unless it proved that, at the material time, notices stating that the area concerned was a restricted area were posted so as to be readily seen and read by persons entering the restricted area. The public road running past the port entrance is not a restricted area of the port - or, indeed, part of the port at all. Neither, from a quick shufti round the neighbourhood via Google Street View, do there appear to be any visible signs designating the public road as a restricted area of the port. Readers can draw their own conclusions from here.